It’s a cow patterned pork bun with ninja masked eyes, no arms, and cut little feet. All it wants to do is jump higher, and its cuteness will compel you to do its bidding! Moony is a platforming distance jumping game where instead of automatically jumping, this time, you must make carefully timed jumps onto narrow platforms and reach the top without losing all your lives. 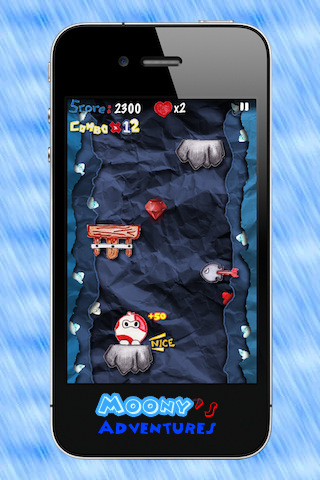 Moony, released by Brother of Two, is available on the iPhone, iPod touch, and iPad for $0.99 with a Lite alternative. Moony’s graphics are really nice. Paper tears, crumpled paper, and an adorably indescribable main character; all of it combines to make a thoroughly cute game. The interface is almost like a child’s drawing come to life and musically, it’s surprisingly epic. The game is simple, so it’s a bit difficult to describe. Enemies sometimes appear, most of the time however, your main enemy is the game itself. Programming and the game engine is pretty frustrating. I would have liked to use any other word for it, but it’s honestly giving me a headache sometimes. Jumping is done with a single tap of the screen but the platforms require strict accuracy just to register your jumps. You can jump and try to land on an edge, but no, the game doesn’t like that and you will just fall right through the platform. If you happen to be able to time it EXACTLY and land dead center on the platform, it will sometimes have animation glitches where your character disappears and reappears instantly on the platform perfectly. The game literally has no engine of movement… it’s just “Is player on platform? Yes? Then replace sprite with this one.” Some platforms are placed in such a way that you cannot collect certain items because you cannot control your jumps. It’s incredibly frustrating for a platforming game to not give you good enough controls. I got too frustrated with Moony. And I didn’t even experience any of the crashing issues that some of the commenters have made in the AppStore. I dunno, it’s just not very impressive. No app should reward your efforts with frustration. At least its graphics are darn good and the game can be fixed with just some renovations to the platform recognition. With a simple fix this would receive a solid 4. 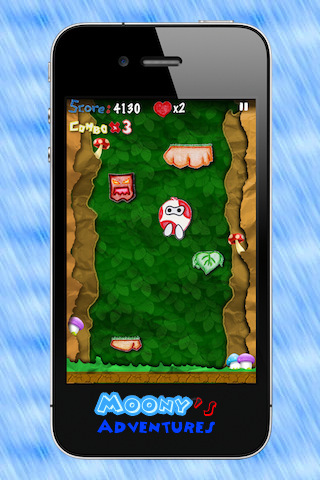 AppSafari review of Moony was written by Joseph Ho on December 13th, 2010 and categorized under App Store, Games, Platformer. Page viewed 3186 times, 1 so far today. Need help on using these apps? Please read the Help Page.